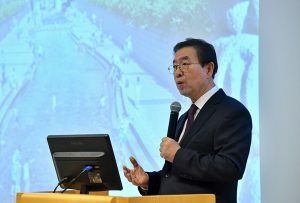 Mayor Park Won Soon visited the 120 Dasan Call Center on March 27 and provided some encouragement to the employees there. He listened to their opinions and discussed ways to improve the current operation of the Center. He also told them that they play an important role by listening to people’s problems, and that they need to always provide kindhearted service to their callers.